Almost every company has that guy. The one many others depend on and can rely on. For Cisco-Eagle, “that guy” has been Gary Goolsby for almost a quarter-century. 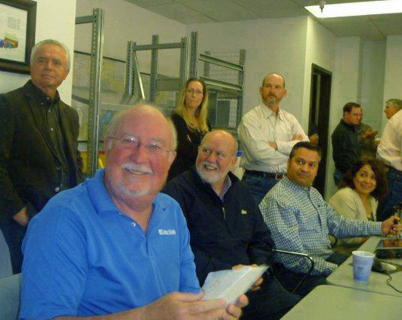 Gary is retiring today and leaving a legacy of customer service, innovative solutions, and friends here at the company, with our vendor partners, and our customers. He is the most successful sales associate in our history. Gary joined Cisco-Eagle in 1988. He’d worked previously at Inca Metal products, where he got his start in the industry assembling steel shelving. Since then, he has installed material handling systems in virtually every state in both distribution and manufacturing operations. His work with our largest clients has resulted in Cisco-Eagle’s rapid growth. When Gary started, our systems group consisted of one person, Vic Leonard. His work resulted in an expansion that helped us become one of the most capable material handing integrators in America. Frito-Lay named Cisco-Eagle its Capital Supplier of the Year in 2003, a very prestigious award that few companies our size ever win. Gary and his team found ways to serve and adapt to client needs that create that kind of relationship. There are few people working here at Cisco-Eagle who don’t owe Gary at least a partial thank you for the way he has helped evolve and grow the company.